This story is written by my 17-year-old son and is published here with his permission. 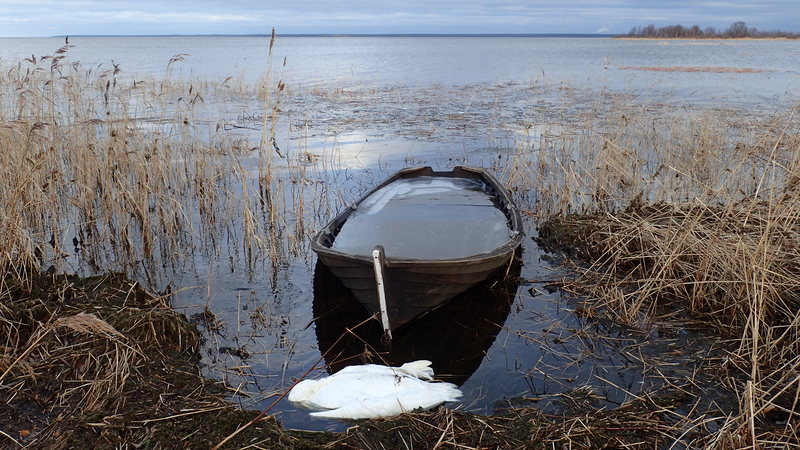 The dead swan in the title picture is real but is not related to the story which is work of fiction. I apologise if anyone finds a picture of a dead animal disturbing, but I’d like to remind that death is a natural end point of the life of a wild animal. The swan in the picture had not been shot. I was out hiking in Kainuu with a friend, let’s call him Mike, when I came across a small lake. It was maybe 400 meters across at the widest part, but it wrapped around a small cape so you couldn’t see the whole waterline. It was about 7 pm on an autumnal evening and we were getting ready to camp for the night. We decided on a small bay next to the cape as our site for the night. The site was surrounded by fir trees so we couldn’t see far. We were exhausted due to the long hike in difficult terrain that day. Mike was lighting the primus stove we used for heating our food. He was so tired that he broke three matches before he could get a fire going. Once we had eaten Mike went to get some firewood for the night. I started writing about the day to our diary. We hadn’t seen a soul all day, not even animals. Suddenly I heard a gunshot across the lake. Right after it came a squawk of sorts and then a splash. I bolted to the shore and realized that the splash had come from the other side of the cape. I set off across the cape and what did I see? A mortally wounded swan struggling in its own blood. I understood that there was a poacher somewhere near. And poachers when in danger of being caught are not the nicest of people. I decided to find a hiding spot and see if the poacher showed himself. After a while of hiding I gathered that the poacher had seen me and run off. I walked to the dead swan. It had been hit to the right side below the wing. I figured I should find Mike and discuss what had happened. Mike was looking for me around the campsite and seemed worried until he spotted me. I explained the situation and asked his opinion on the next course of action. He said that we should file a report, after all the swan was a protected animal. I checked my phone but there was no reception. We decided on burying the creature and filing a report as soon as we found a spot where I could call the authorities. I started on the pit while Mike went to bring the swan on a tarp. Luckily the ground was mostly sand so the digging went quickly. Soon Mike arrived with the regal bird. With the two of us the process was fast. By 10 pm the pit was covered and the bird at his final resting place. We were dead tired and as soon as we lay down we were fast asleep.